After his blockbuster MMFF movies “Sisterakas” (2012), “Girl, Boy, Bakla, Tomboy” (2013), and “Praybeyt Benjamin” (2014) with award-winning Director Wenn V. Deramas, phenomenal star Vice Ganda once again hits the silver screen in the coming Christmas Day in one of Star Cinema’s entries for this year “Beauty and the Bestie”. This time, he is teaming up with the country’s Primetime King and prominent action-drama actor, Coco Martin as he gets into another comic action set up. Other than the fresh tandem of Vice Ganda and Coco Martin, what’s so enticing in this movie is the inclusion of the country’s current hottest love team, Jadine. Perhaps, that fact alone already gives a good match with the other MMFF entry “My Bebe Love (#Kiligpamore)”, which features the tandem of giant stars Vic Sotto and Ai Ai de Alas Alas along with the country’s first-ever “Kalyeserye” superstars Alden Richards and Maine Mendoza. Indeed the movie that includes the notable loveteam of James Reid and Nadine Lustre is among the most anticipated in this year’s filmfest to be the top-grosser and potential Best Picture winner. Just remember the tremendous success they got in their previous movie projects “Diary ng Panget”, “Talk Back and You’re Dead”, and “Para Sa Hopeless Romantic”. In “Beauty and the Bestie”, the two lead stars will be portraying the role of best friends got separated for some time but then reunited by a mission. James Reid’s and Nadine Lustre's characters will be the respective siblings of the said best friends. Overall, the movie is jam-packed with humorous lines added with “kilig” scenes and guns-and-bullets action stunts. 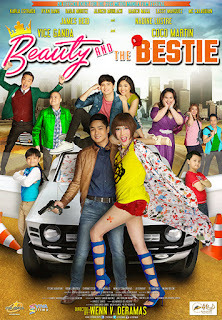 Along with the other MMFF entries, “Beauty and the Bestie” will be released on December 25, 2015. It would be a good movie choice if you prefer to have lots of laughter in this coming Christmas Day.